Lois Pollock is an experienced and now retired social worker who specialized for over 30 years in HIV/AIDS, palliative care and frail aged care. Between 1988 and 1995, I held three social work positions - in Greenwich (generic & child protection work); Royal Borough Kensington & Chelsea (specialist HIV/AIDS worker) and finally in the London Borough of Newham, where I was appointed as a specialist social worker for the African community affected by HIV/AIDS. In those latter positions I gained a deal of experience working with people infected and affected by HIV/AIDS, at a time of ignorance and stigma in the wider community. I was one of a group offering alternative funeral services to the gay community when some religious institutions refused to perform services following AIDS deaths. While working in Newham I took my first visit to Uganda. I learned the issues facing elderly grandparents who care for young children, left behind by desperate parents who had fled to the UK. Since 1995 I've made regular visits to Uganda, facilitating projects in rural and urban communities. In 1995 I needed a break from direct HIV/AIDS work, not least because numbers of close friends had died. Appointed as one of a team of Senior Practitioner Social Workers at St.Christopher’s Hospice, London, for the next five years, I carried an individual caseload, ran bereavement support groups with colleagues, offered training programs internally and to the wider community and continued facilitating residential therapeutic workshops for professionals working with the dying or those with life threatening illnesses in the UK, Spain and Romania. Resigning from the hospice at the beginning of 2000 I spent the next 18 months working as a freelance consultant to a palliative hospice in Mallorca, Spain and pursued my psychotherapy practice before returning to Australia where I had been born. Between 2002 - 2011, I worked as a social worker and then manager of a social work/community worker team at Jewish Care, Sydney. The majority of the clients were frail, aged Holocaust survivors. There I gained new skills and experiences - particularly in the area of dementia - and was able to build on previous experience of working with clients suffering past trauma. Amongst a variety of duties, I facilitated a weekly art group for people living with moderate to advanced dementia. (You can see some of the examples of the wonderful creative art produced here). Retiring in 2011, I returned permanently to live in London. It is from here that I now fundraise to continue my work in Uganda. That's now mainly focused on community savings groups; teaching small business start up / entrepreneurship; and offering both Memory Book and Life Story book trainings to community groups and in secondary schools. With other trustees of Education & Health Trust Uganda, we hope to promote the work of specific established community projects, and raise funds to support ongoing education for disadvantaged young men and women. Over the years and repeated trips to Uganda I have written various diaries and stories to record my experiences. You can read some of these here. 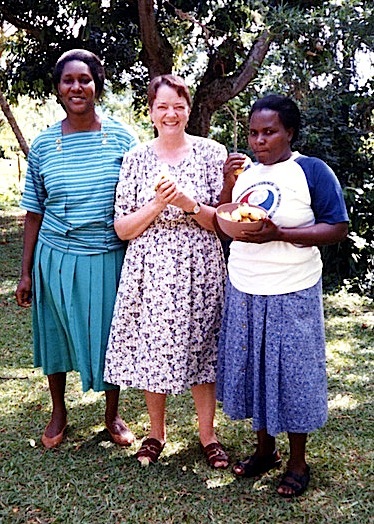 Lois on her first visit to Uganda in 1995 with Revd.Agatha Senyimba. Agatha was a registered nurse who began early support groups for women who had been infected with HIV by their late husbands. Working from Mulago hospital, she helped a group of women develop a drumming and theatre group which traveled around the slums of Kampala and outlying villages, teaching other women about the importance of HIV testing, and encouraging them to live well with HIV. Remember, this was in the days before there were effective anti-retroviral treatments and a diagnosis of HIV was likely to lead to premature death. Agatha was remarkable in the support she also gave to many, many grandmothers who were bringing up orphaned children. From her modest home, she made cauldrons of porridge to feed hungry chillren and grandmothers and this was given freely, every day. Sadly, Agatha died of breast cancer in about 1999. the woman pictured to the left of Lois is Vivien Kityo who was a good friend to Agatha, and for many years, Vivien who remains active in the Mother’s Union, worked tirelessly as a counsellor and volunteer for Sanyu Babies Home in Kampala. Lois returned to visit a family with whom she has had various contacts since 1995! On this occasion, she is holding the latest addition to the family - a baby born a couple of weeks earlier. 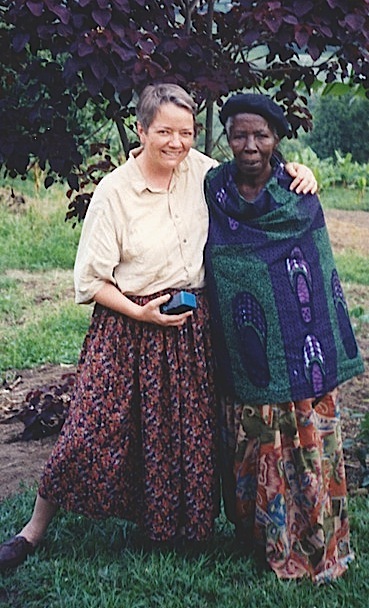 Lois with a widowed mother, H, in her village in far Western Uganda. 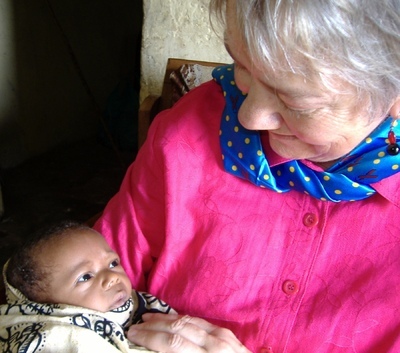 H is typical of many grandmothers in Uganda - responsible for bringing up grandchildren who have been orphaned through AIDS. In her case, one of H’s daughters and two of her sons had died of AIDS and another son and daughter are living with AIDS. Now in her eighties, she still supports great grandchildren. Her own health is failing and two years ago, Lois was able to source a hospital in Mbarara where H’s cataracts were successfully removed. Without the financial assistance, like many others of her age, H would have gone blind. The operation cost comparatively little, but was way outside the scope of someone who has no daily income but survives because she has land and can grow food. 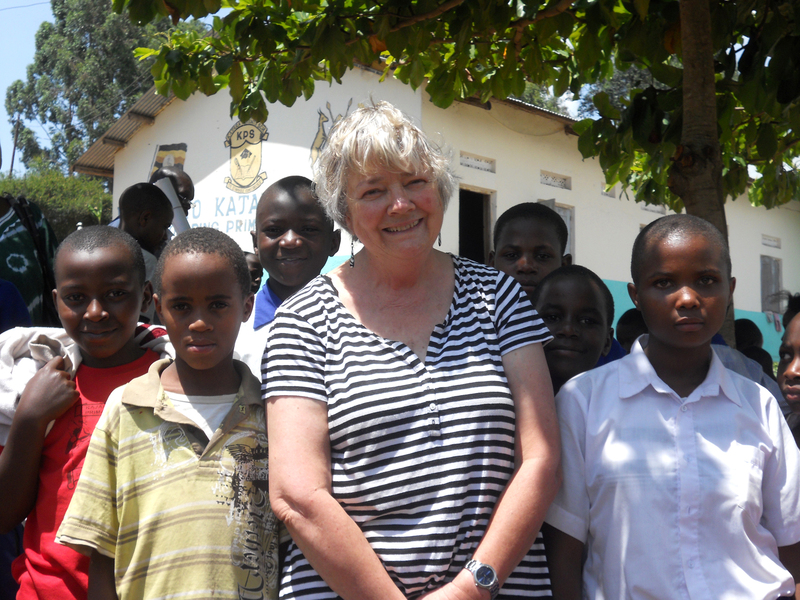 In 2008 and 2010, at the request of TASO (The AIDS Support Organisation), Lois worked with a group of rural small hold farmers who are living with HIV. They live in close proximity of each other and had begun a savings group. 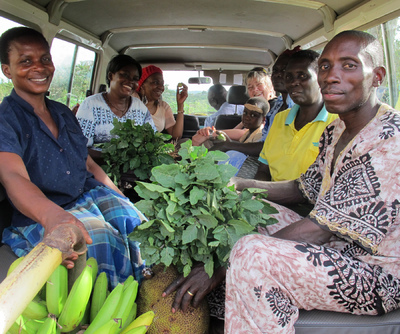 From the profits of that, they were attempting a variety of small business projects - growing and marketing vegetables as seen in the photo; pig farming and craft making. The trainings were about record keeping; researching a business before beginning; how to finance a new start business - undertaking a SWOT analysis. You can read more about training and small business start up elsewhere on the site.